TOKYO, Jan 17, 2019 - (JCN Newswire) - Hitachi, Ltd. (TSE: 6501) today announced that it has decided to suspend its new nuclear power stations project in the UK (Horizon Project) that Horizon Nuclear Power Limited (HNP), a subsidiary of Hitachi and power generation development company in the UK, has been undertaking at Wylfa Newydd on Anglesey Island in north-west Wales. The decision was made from the viewpoint of Hitachi?s economic rationality as a private enterprise. Accordingly, Hitachi plans to post an impairment loss and other expenses on consolidated financial results for fiscal 2018, the year ending March 31, 2019 (from April 1, 2018 to March 31, 2019). It also plans to post an extraordinary loss on unconsolidated financial results for fiscal 2018, the year ending March 31, 2019. Based on these points, Hitachi has revised its full-year consolidated business forecast for fiscal 2018, the year ending March 31, 2019 as follows. Hitachi acquired HNP from the UK subsidiaries of the two German power companies for 88.9 billion yen (697 million pounds) in November 2012 to develop its nuclear business in the UK and to contribute to the UK Government's energy policy, and to maintain and reinforce the business base that supports the Japanese nuclear industry. Based on an Advanced Boiling Water Reactor (ABWR(1)), which is a "Generation III+" reactor with an extensive construction and operation track record in Japan, Hitachi has worked on developing a nuclear power plant in order to build two UK ABWR units adapted to UK requirements. Hitachi has held detailed discussions with the UK Government over various options about how the UK Government might support the project including potential for equity and debt investments. The parties, with the cooperation of the Japanese Government, have held discussions in good faith in regard to the financial structure for the project and various conditions for the building and operation of the nuclear power station. Since the acquisition of HNP, Hitachi has set the following three points as the main criteria for business continuation and reviewed the Horizon Project from the viewpoint of its economic rationality: (1) securing reasonable returns as a private enterprise, (2) realizing a financial structure on the premise of making Horizon Project off balance sheet, (3) limiting an investment amount to an acceptable range as a private enterprise. Unfortunately, despite the best efforts of everyone involved the parties have not been able to reach an agreement to the satisfaction of all concerned. As a result, Hitachi has decided to suspend the project at this time from the viewpoint of its economic rationality as a private enterprise, as it is now clear that further time is needed to develop a financial structure for the Horizon Project and the conditions for building and operating the nuclear power stations. 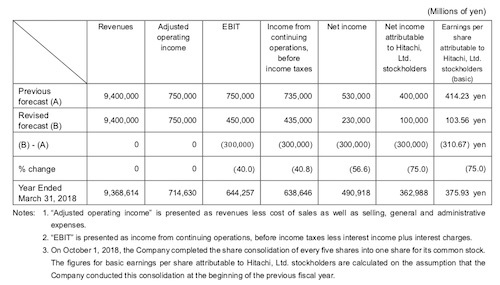 Consequently, Hitachi plans to post an impairment loss and related expenses of approximately 300.0 billion yen as other expenses on consolidated financial results for fiscal 2018, the year ending March 31, 2019 (from April 1, 2018 to March 31, 2019). It also plans to post losses of approximately 300.0 billion yen associated with the suspension of the nuclear power plant construction project in the UK as extraordinary losses on unconsolidated financial results for fiscal 2018, the year ending March 31, 2019. These amounts are current estimates, and will be settled in its consolidated and unconsolidated financial results for fiscal 2018, the year ending March 31, 2019. To further contribute to UK energy policy, Hitachi will continue to discuss a nuclear power program with the UK Government. Also going forward, considering that Hitachi has the global head office function for its Railway Systems business, the rolling stock manufacturing base, and the base for research and development of cutting-edge digital solutions in the UK, Hitachi will maintain its contribution to the UK economy, further technology development, and improvement of QoL(2) in the UK through its Social Innovation Business. In Japan, Hitachi will be steadily engaged in the restarting of domestic nuclear power plants and the decommissioning of Fukushima Daiichi Nuclear Power Station for the foreseeable future. Furthermore, Hitachi will continue to develop businesses that make use of its strengths with strong reliability and expertise, such as solutions to support improvements in availability of power plants and extension of plant life. The impairment loss of approximately 300.0 billion yen will be posted as other expenses due to the suspension of the Horizon Project. As a result, Hitachi has revised its forecasts for consolidated financial results for fiscal 2018, the year ending March 31, 2019, which were announced on October 26, 2018, as indicated above.